Recently, we received the welcome news that another petting zoo – this time, at the University of East London – has been cancelled because of ethical concerns after we wrote to the organisers. 1. They’re highly stressful for animals. Animals – and especially timid prey animals such as rabbits and chinchillas – generally don’t like being handled all the time. At petting zoos, they have no choice about the matter. And because these events are often held in public places, crowds and noise only add to the animals’ discomfort. 2. Animals often come from breeders like this. A recent investigation uncovered the horrific conditions at European breeding facilities where animals are “mass produced” to maximise profits. And the huge numbers of animals churned out by these breeders have led to an animal-homelessness crisis. 3. Life on the road takes a terrible toll. 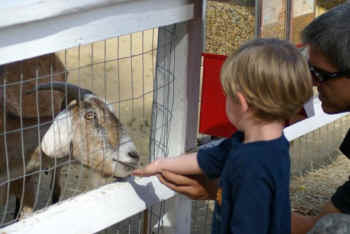 Animals in petting zoos spend most of their time being carted around from one exhibit to another, often in small cages where they can fulfil few if any of their natural needs. This causes suffering and frustration which, over time, can lead to abnormal, neurotic and even self-destructive behaviour. 4. Petting zoos only want the “cutest” animals. That means that animals who get older or become more difficult to handle are often disposed of – that is, abandoned or killed to make room for crowd-pleasing babies. 5. There are health risks for humans, too. Experts indicate that petting zoos are hotbeds of serious pathogens, and they have been linked to outbreaks of diseases such as E coli, with the elderly and young children particularly at risk – which hardly amounts to “family-friendly” entertainment. They’re sensitive individuals, who deserve better than to be treated as props for human entertainment. If you ever learn about plans for a petting zoo near you, please write to the organisers and ask them to replace it with an event that doesn’t involve exploiting animals, such as a craft workshop or a bouncy castle. Let us know about it, too.